100 New Yorkers are evicted every day. 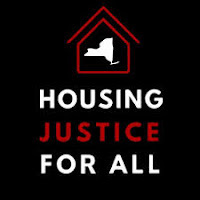 It's now or never for housing justice. We need Universal Rent Control! Eliminate loopholes like the vacancy bonus, vacancy decontrol, preferential rent and MCIs/IAIs (permanent rent increases for improvements to the whole building or to individual apartments). Click here for the flyer in English and Spanish.